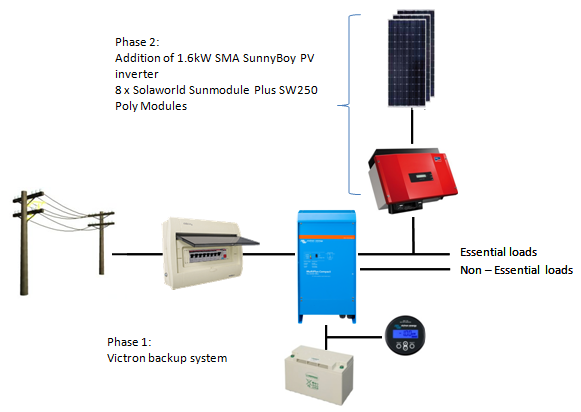 Provision for load shedding and grid failures using the Victron backup system. System is ready for a 2kW PV solar system. 2kVA battery inverter for essential loads with 300Ah battery backup (7.2kWh, or 3.6kWh at 50% DOD). Battery cycle life of 1500 cycles at 50% DOD. Monitoring using Victron BMV. Other communication devices available on request. Prewired distribution board for all system components including PV input. Prewired distribution box including string fuses, DC surge protection, AC surge protection, output circuit breaker, enclosure, cabling, battery fuses. Supplement your household loads up to 2kW peak PV power. Daily Energy 9kWh to 12kWh per day irradiation dependent. Reduce your energy bill by using Photo Voltaic power. Payback periods as good as 4 years. 1.6kW Grid-tie Inverter synchronizes with AC grid to provide power for self consumption and/or grid feedback.